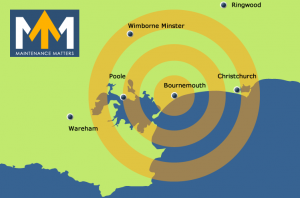 Maintenance Matters head office is based in Bournemouth, however we cover all areas of Dorset and Hampshire. Barton On Sea, Bear Cross, Boscombe, Bournemouth, Branksome, Bransgore, Broadstone, Burton, Canford Magna, Charminster, Christchurch, Corfe Mullen, Creekmoor, Hamworthy, Highcliffe, Hinton Admiral, Holdenhurst, Kinson, Longham, Lytchett Minster, Meyrick Park, Moordown, Mudeford, Oakley, Parkstone, Poole, Sandbanks, Sopley, Southbourne, St Leonards, Three Legged Cross, Throop, Upton, Westbourne, West Parley, Wimborne Minster, Wimborne. If you’re looking for a plumber, carpenter, plasterer, builder in the Bournemouth, Poole or surrounding area, then look no further than Maintenance Matters. No job too big or too small.